You may have heard of the gender wage gap—where the typical woman earns 83 cents for every dollar earned by her male counterpart. But, what would your pay look like if earnings had kept pace with productivity growth? EPI has developed a cool new tool, which calculates how much you could be earning—when accounting for age, gender, education, and salary. 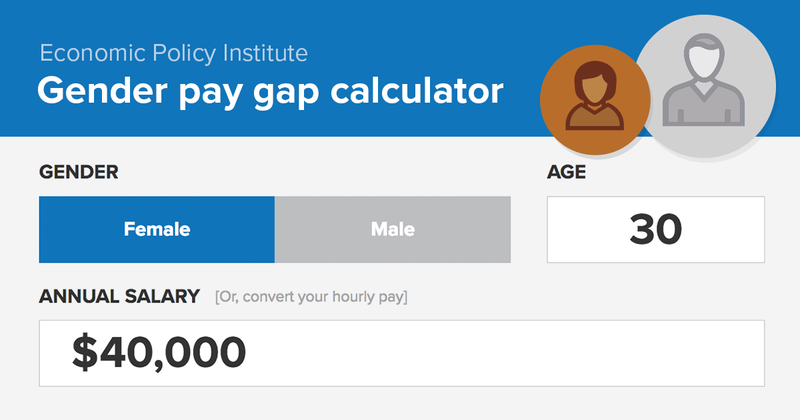 The Gender pay gap calculator will help women and men understand how the pay gap and overall inequality affect their pay. Click here to try out EPI’s new calculator. Calculate how gender and inequality affect your pay. The results are somewhat staggering. If the gender wage gap were closed and the economy’s gains were more broadly shared, women’s median hourly wages would be 69 percent higher than they are today. Together let’s create an economy that works for everyone, not just the wealthy few.